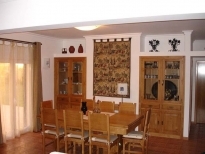 Vacation VILLA MARGARIDA for 12 people with private swimming-pool, garden and car parking. 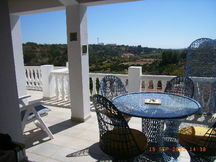 Very quiet and relaxing place in the Algarve region countryside, yet very close to urban facilities. Near the city of Portimao and the famous ocean beach Praia da Rocha (southwest region of Portugal). 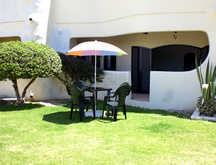 If you are thinking about sunny vacations in southern Europe, you have just found the right place! Suitable for large families and to share among friends. Suitable for children as well as for elderly, handicapped or infirm. Pets welcome. 6 bedrooms, 4 bathrooms, 1 toilet. Towels and linen provided. Weekly maid service. Dish-washer, barbecue. Satelite TV and Hi-Fi listening (CD/DVD). From A22, take exit 5 towards Portimão. At the next 4 roundabouts, always take Portimão direction. 200 metres after the 4th roundabout, turn right to enter the gas station TOTAL and turn right again. Continue 2,8 Km along road EM1360. Turn right to enter Urbanização do Belmonte and search villa nr. 54. 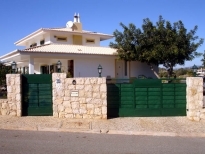 Please quote reference: a4m: 1238 villa "Villa Margarida"